I know, by the title of this post you'll be like, aren't summers supposed to be for leisure and holidaying? Yes they most definitely are, but what if I told you there was a way that you can make even your holidays productive. We always have those things we want to achieve, but we always put them for after wards and tend to forget them. So here are some tips that I have learned along the way that can help you achieve tiny goals while on holidays. 1. MAKE A LIST: The most crucial part is always making a list and knowing what you want to achieve (during the summer). Keep the list as short as possible as you don't want to over pressurize yourself or feel demotivated. I would keep the list only upto 3 things that are not as hard to achieve but still helps you to achieve your goals. 2. DO STUFF: If you want to get an internship, get it! Have a place you always wanted to go to? Visit it! Want to start a blog? 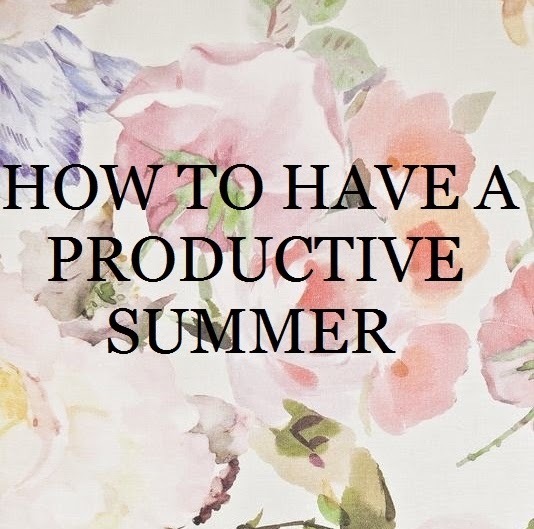 There isn't a better time to start it then during summer. Want to lose a couple of inches? Go for a 20 min walk in the park closest to you. The basic idea is to do anything, even the tiniest thing that would push you towards your main goal. Watching netflix or binge watching your favourite tv show isn't really going to help you in your goals. Keep all that for the night. Or make it a habit to finish off your work first and then do whatever the hell pleases you. 3. WORK LITTLE, PLAY HARD: Not your basic advice line now, is it? The idea behind this is not to let your goals come in between of your hard earned holiday time. Just put say about 30 mins everyday into achieving your summer goals, and before you know it! You'll be there. I am not really sure if this will help you or not! But I had a thought about it and so I decided to write a blog post on it. Hope you guys enjoyed reading something apart from the usual beauty stuff on the blog.